With the holidays fast approaching, it’s time to think about what to wear to those holiday dances or, perhaps, Lindy Focus or Snowball for New Year’s Eve. I am in love with this 1940’s dress in fuschia – an unexpected color, but close-to-red and festively bright, with trimmings of sequins in the shape of…macaw? 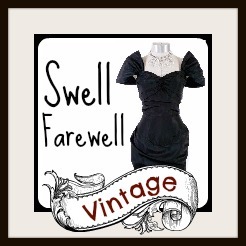 It looks like an eighth note at a distance…regardless, this dress would be the topic of conversation at any fête. It’s 20% off until the end of today when Fab Gabs’ sale ends! I am always pleased when sellers list seasonal items during the right season – when you are in the mood for something, retailers usually respond, and right now it’s the smell of cinnamon, clothing that sparkles, and Ella Wishes You a Swinging Christmas playing overhead (how did they know?! 😉 ). What would a proper holiday dress selection be without velvet? 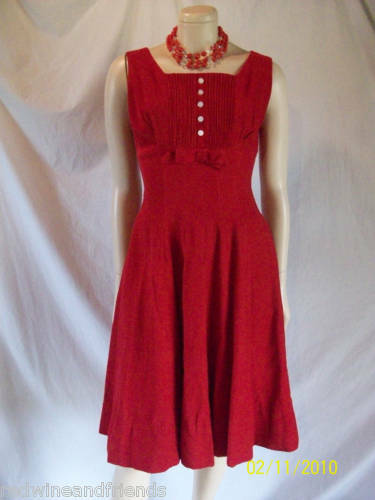 Please ignore the crappy photography from this seller and focus on the awesomeness of the tucking, draping, and gorgeous belt buckle on this 1930's dress. I heard on NPR this morning that it’s the last day to send packages that will be guaranteed delivery by December 25, so here’s your last holiday item post for the year. I love when guys wear holiday ties that are both festive and classic at the same time. So many fall victim to the novelty tie at this time of year, but there’s a way celebrate the holidays through your wardrobe without having to don Homer Simpson in a Santa suit. I found these ties at Beau Ties Ltd. of Vermont that would look great for a holiday dance or family occasion. I think the key here is subtlety, color, and repetition of pattern. For each tie you can specify width, neck size and style (freestyle, pre-tied, or clip-on). Also, for some of these items, the store offers a matching pocket square, ascot, cummerbund, and cravat. Waddles Bow Tie - for your pengin suit, eh? Two Turtle Doves Bow Tie - there are other ties for each of the twelve days of Christmas on this website as well! 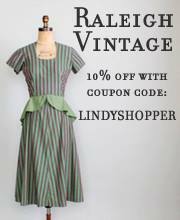 If you are looking for a last minute holiday dress, you may find something you like at Shabby Apple in their vintage-inspired All That Jazz collection. I love the photo shoot for this collection, as they’ve done a fantastic job of accessorizing with hats, gloves, jazz musicians, and vintage cars. Shabby Apple makes great basics that are easy to wear to both the office and swing dances and this collection is no exception. Also, starting today, and for the next 12 days, stop by the Shabby Apple fan page on Facebook for a coupon code for 20% off one great product each day between the time they’re posted and 5:00 p.m. MST, 7:00 p.m EST. It’s a 12 days of Christmas sale! Well…everyone is having a sale today, but I’ve been particularly smitten with Mod Cloth‘s recent offerings, especially their holiday dresses. That’s one of the beautiful things about swing dancing, is that there’s always a dance party to attend, with a little sparkle added during the holidays. Mod Cloth also has some great gift ideas for guys and gals – I found some great things to stash under my Christmas tree for friends and family. All Aboard Heels - actually a pair of divine Remix shoes, on sale for $100, size 9.5 - last pair!